I've been having an issue where the brain reboots at random. The reboots wouldn't be a problem if it wasn't for the effects it has on the active recipe. After it has rebooted, the remote still shows all the controls for the active recipe and everything seems to be working fine until i either try to shut down (1) or tap the back arrow (2) to go back to the recipe selection screen. If I click on the shutdown/power button it just exits the recipe without powering off anything and returns to the recipe selection screen. The only way for me to turn off all devices after this is to either crawl around and press the power button on all devices or put a pillow over the brain (to stop any IR signals during the start of the recipe) and start the recipe again and then press the power button on the remote. If I tap the back button to return to the recipe screen it behaves as if I don't have an active recipe, meaning that he only way for me to get back to the controls for the recipe that should be active is the pillow solution described above. I've had this issue for quite a while but I figured I wasn't the only one with this issue and that someone already brought this to your attention so it would be fixed by now. A related issue is with the automatic update feature. When I activated that, the brain began rebooting many many times both day and night, and even though the setting says that it will try to do this when no recipes are running it still did this while I had running recipes which of course caused the same issue I explained above. Because of this I've turned off that feature and since then it reboots less frequently but why it reboots at all is a mystery to me. A "small" update regarding this. Yesterday I powered everything off after using the "pillow" method mentioned above, so it seemed everything was in sync. Today I tapped the PS4 recipe and everything except the PS4 was powered on. On the remote it showed all the controls for the recipe and I've made shortcuts in the recipe for the PS button and the Power on function of the PS4 but tapping them did nothing. I powered on the PS4 with the Dual Shock Controller instead but I still couldn't control the PS4 with the Neeo remote no matter what I did. Returning to the recipe selection screen I got the same result as described in the post above; the remote behaved as if no recipe was active. 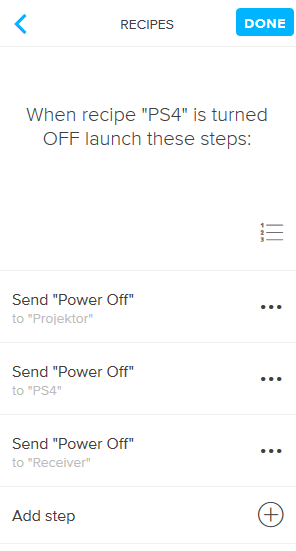 Tapping the PS4 recipe again made the remote run the circle animation for activating the recipe but it didn't send any power commands to any of the devices, it only sent input commands, so somehow it seemed to be aware that (some of) the devices was powered on. I went through these steps a couple more times with slight variations but it didn't help. Finally I pulled the plug to the brain and when it had rebooted I tapped the PS4 recipe again (with a pillow over the brain since I was sure that this time, after a complete power cycle, it would send power commands and I didn't want it to turn off any of the devices) and I could at last control the PS4 with the Neeo remote again but...I now notice that going back to the recipe selection screen on the remote still doesn't show a list of active recipes...Just to be sure that it's not just an issue with the remote I opened the app on my iPhone and it behaves the same way; returning to the recipe selection screen from an active recipe doesn't show a list of active recipes as it used to do in an earlier version of the firmware. The brain seems to be having issues detecting active recipes and doesn't show a list of them on the recipe selection screen. 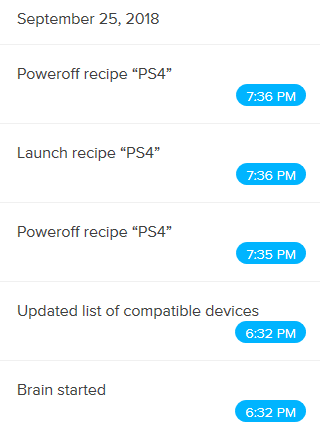 If the brain reboots when I have an active recipe everything seems fine until I try to power off which won't send any power off commands to the devices but instead just exits the recipe and returns to the recipe selection screen. Hi, Peter Lövgren. Thank you for your amazing detailed report! Did you enable Prioritize NEEO Link on your NEEO remote? Can you try to connect your NEEO Brain directly to your router via ethernet, just to see if there is any difference? Where is the NEEO Brain power cable plugged in? (power strip, wall socket, USB power strip,...) Can you confirm that your NEEO Brain receives enough power? Can you also try to repair your NEEO remote once? >Turn it off, then press and keep pressing the hard buttons POWER and BACK on the NEEO Remote, this will bring you back to the setup screens of the NEEO Remote. Is your PS4 directly connected to the NEEO Brain or via an AVR? Which devices are involved? Could you also provide me with your hostname which can be found in the about section in your NEEO app? Thanks. Both of my issues above seems to be intermittent as everything has worked for 2-3 days now without any issues...I can see from the event history that the brain has been on since 8:09 PM September 16. Whenever I have an issue with the brain or remote I always go to the event history to see if the brain has rebooted as it seems to be the intermittent reboots that's causing my issues. No. I had it active from the beginning but turned it off after one of the firmware updates, or if it had turned it self off after an update and when I tried to enable it again I got a message about you recommending only turning this on if I'm having issues with my wi-fi or at the request from neeo support. As I, besides from Neeo, have no issues with my wi-fi, I've left it in the off position. Same as above. Had it connected through both wi-fi and wired at the same time before but for some reason I pulled the plug and went with just wi-fi. I've had issues both before and after pulling the plug so it doesn't seem to make any difference. I don't have a device for measuring this to confirm that it receives enough power but as it's connected directly to a wall socket there should be no issues here. I'll maybe try this the next time it happens. But the issue seems to be with the brain, not the remote, as the phone app behaves the same way. The PS4 is connected via an AVR. The devices involved in the recipe is the PS4, an AVR and a projector. Specifically they're a Denon AVR-3312 and a Sanyo PLV-Z700. As it's an intermittent problem it's tricky to troubleshoot. Remote repair seems like it wouldn't help in this scenario as the app on the phone behaves the same way so the issue seems to be with the brain. The next time it happens I'll do some testing with wired network and Neeo Link and see if the situation improves. As this issue has come and gone several times since I got the devices I'm counting on it happening again and therefore don't consider this solved. You're welcome to troubleshoot what you can with the info provided above and I'll gladly take any more suggestions you might have for me to try. I went in to the event history and could see that the remote hadn't rebooted since 16:th of September. So obviously my conclusion that this has something to do with the intermittent reboots seems to be wrong as the issue still occurs even if the brain hasn't rebooted. If I go back to the recipe selection screen on the remote now, it shows the same view as in the phone app - it looks like ther'e are no active recipes. But if I tap on the PS4 recipe again it runs it animation telling me it's powering on the PS4 and switching inputs on the other devices. But it doesn't send any power commands to the projector or receiver, so somehow it seems to be aware of the power status of those but doesn't detect that the PS4 is on so it shuts it down...If I wait until the PS4 is in standby and ready to receive another power command and run the recipe again it boots the PS4 up again but doesn't send any power commands to the other devices. If I try to control the PS4 with the remote in this state, there is a severe input lag of anything from 5 seconds and more. The input lag is the same in the phone app so it's not the remote that is the issue. The lag also only affects the PS4 as the other devices react instantly to button presses. I've had the issue with the input lag many times before and the only way to fix it has been to power cycle by pulling the power cord. Now, since you in the latest update added the ability to add recipes for restarting the brain and controlling the LED I've created a recipe for restarting so I tried it this time, but it didn't do any good as after the restart everything behaves exactly the same way. I was just going to watch a movie but instead I'm spending my time troubleshooting why the device I chose to replace my old Logitech Harmony is doing everything it can to stop me from doing just that. I'm really beginning to suspect that there's an issue with the brain and that it would either have to be repaired or exchanged for a new one. Any update on this? I'm now back to the version of the bug in my original post above and it's been doing that for two days. This means I'm able to power on everything with the recipe but then the brain reboots sometime during the movie and when I try to power off it just returns to the recipe selection screen and I have to put a cover over the brain, run the recipe again and power off to shut everything down. Image of the event history below. By the way, which is the recommended way to contact support? Is it here on Planet Neeo or is it by submitting a request? Thank you for all the information so far, that helps a lot. I've forwarded this to our developers to check this. I'm sorry for my late response. Can you please tag me the next time? By the way, which is the recommended way to contact support? There is no recommended way - just as you wish! 🙂 We appreciate it if you take your time to post on Planet NEEO as it might help a lot of other users with the same experience. If you prefer direct support you can also call our support line, M-F 9 am - 5 pm PST: 1-844-669-6336. Ingrid here are screenshots of the recipe. The bug is not specific to that recipe but happens to all of them, but this is my most used recipe and the steps are practically identical for all recipes, just replace the PS4 with any of my other devices. Yet another update on a variation of the this issue. I've noticed strange behavior before from the remote if I charge it while a recipe is running but that issue has occurred so rarely that I'd almost forgotten about it, but yesterday it happened again. I ran the PS4 recipe and after I had began watching a movie I put the remote in the charging cradle. When I later picked up the remote again I could no longer control the PS4 with it, so I tried with the phone app but that didn't work either. I could still control the receiver and the projector and when I powered off the recipe it shut down those two devices but left the PS4 on. Instead of doing anymore troubleshooting I just powered off the PS4 with the power button on the console itself. Today when I ran the PS4 recipe again, it powered on the receiver and the projector but not the PS4, so the connection to the PS4 hasn't been working since I put the remote in the charging cradle yesterday. Checking the event history I can see that the brain hasn't rebooted since many hours before I ran the PS4 recipe yesterday so this issue doesn't seem to be related to the reboots. Peter Lövgren Thank you very much. We are looking into this. I'll come back to you as soon as possible. Ingrid Any update on this one yet?